If you are currently taking classes, or are in any situation where you need to learn a large amount of facts you may have taken it upon yourself (or are wanting) to create flash cards to help you with the learning process. Update: OpenCards is a free standalone flash card learning software now. Usually, this requires getting flash cards, writing all of your information on them, and then going through the pile over and over again. There is a better, more modern way, to do this. The OpenOffice Impress OpenCards extension allows you to take a bare-bones presentation and use each slide as a flash card. Not only is a great tool for learning, it's not killing trees AND a stack of files on your PC is going to take up less room than a stack of paper flash cards. But is this as easy as it might seem? If you already know how to create a presentation in OpenOffice Impress - yes. If you're not sue how to create a very basic presentation then you might want to figure that process out before embarking on the creation of flash cards. Either way, you can install the extension so that when you have mastered the basic presentation, you are ready to go. Installing this extension is like installing any OpenOffice extension. The first thing you need to do is download the extension file. Once you have that file downloaded open up any of the OpenOffice tools (or even the main OpenOffice window), go to the Tools menu and click on the Extension Manager entry to open the Extension Manager tool. From the Extension Manager window (see Figure 1) click the Add button and then navigate to where you saved the OpenCards extension file. 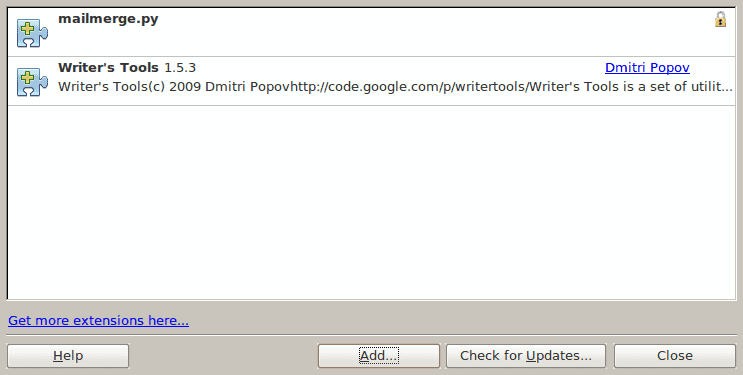 Once you have found the file click the Open button to install the extension. When OpenCards is installed it will be listed in the Extension Manager window and you will need to then restart OpenOffice to complete the installation. Now fire up OpenOffice Impress and create a new presentation. A bullet point in the body. OpenCards works like this: It will start a special slide show with your presentation. For this slide show it will present you the title of a slide (which will be in the form of a question or however you want to use your flash cards) and, when prompted, will present to you the answer. Let me show you an example. After you have completed your presentation go to the OpenCards menu and select the Last Minute Learning entry. This will open up a smaller window and alter your presentation window to show the first slide as a flash card (see Figure 2). As you can see, the title of the card is the only portion presented to you. When you are ready to see the answer you just click the "Show Completed Card" in the smaller window. When you click that you will see the answer in the body of the slide and the smaller window will change asking if you remembered the card "Perfectly" or "Not at all". When you answer this question it will automatically go on to the next card. Repeat this until you have completed the rotation of the cards. You will notice, once you have mastered all of the cards in your presentation, you can not start the presentation. In order to restart the presentation you have to click the Reset Learn-State button in the Last Minute Learning window. OpenCards also contains a Long-Term Learning feature which will be covered in another article (as it is far more complex than the Last Minute Learning). This extension is an outstanding means to learn facts for school, work, training, etc. If you're looking for a free flash card solution that has the ability to retain your learning statistics, OpenCard is your tool. The OpenOffice Impress OpenCards extension allows you to take a bare-bones presentation and use each slide as a flash card. There are programs that are specifically designed for spaced repetition learning and work far better than the method described here. Check out Anki (http://ichi2.net/anki/). It’s free, powerful, easy to use, open-source, cross-platform, supports media, let’s you study online, etc.